Break out your passport because Arrow Films is ready to take you on a journey across the globe for a taste of cinema from all corners. 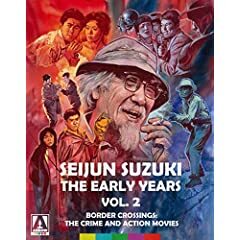 First up, the Arrow express takes us to Japan with the release of Seijun Suzuki: The Early Years, Vol. 2 - Border Crossings: The Crime and Action Movies. This set brings to home video for the first time outside of Japan, 5 films from the first 5 years of Suzuki's career (1957-1961). Released under Nikkatsu's Borderless Action line, these thrillers of mob warfare and exuberant action helped set the stage of Japanese action to come. Moving from the islands of Japan to the island of New Zealand with the release of Roger Donaldson's Sleeping Dogs. Based on the novel Smith's Dream, Sleeping Dogs helped launched the New Zealand New Wave movement, introducing a system of government tax breaks and creating a boom of film production in the country. The film is also significant for starring a young Sam Neill who would go on to be sort of a big deal. The next stop on this April adventure takes us to Europe with a pair of spaghetti westerns with A Pistol for Ringo & The Return of Ringo: Two Films by Duccio Tessari. While Tessari doesn't have the quite the name recognition as Leone, he was a major player in the spaghetti western world having co-written A Fistful of Dollars a year before making his back-to-back Ringo films. The films were a rousing success and helped kick-start the career of actor Giuliano Gemma. Arrow's journey through the world of film comes to a close in the United States with the 80's cult classic Killer Klowns from Outer Space. Since the beginning of time, clowns have always been scary rather than funny, but it was the release of the Chiodo Brothers horror-comedy that forever cemented clowns as space creatures with a thirst for human blood. If this circus comes to your town, move. April releases from Arrow will also include two more books - All the Colours of Sergio Martino and The Hitcher. The former takes a look at the 40 year career of the Italian maestro Sergio Martino, while the latter exams the complex beast that is Robert Harmon's 1986 film The Hitcher. Finally, the month will see the Arrow Records release of Autopsy: Original Soundtrack from Ennio Morricone on marbled orange vinyl. Previously unreleased on vinyl, this soundtrack is one of the most experimental scores from the Oscar winner's legendary career.